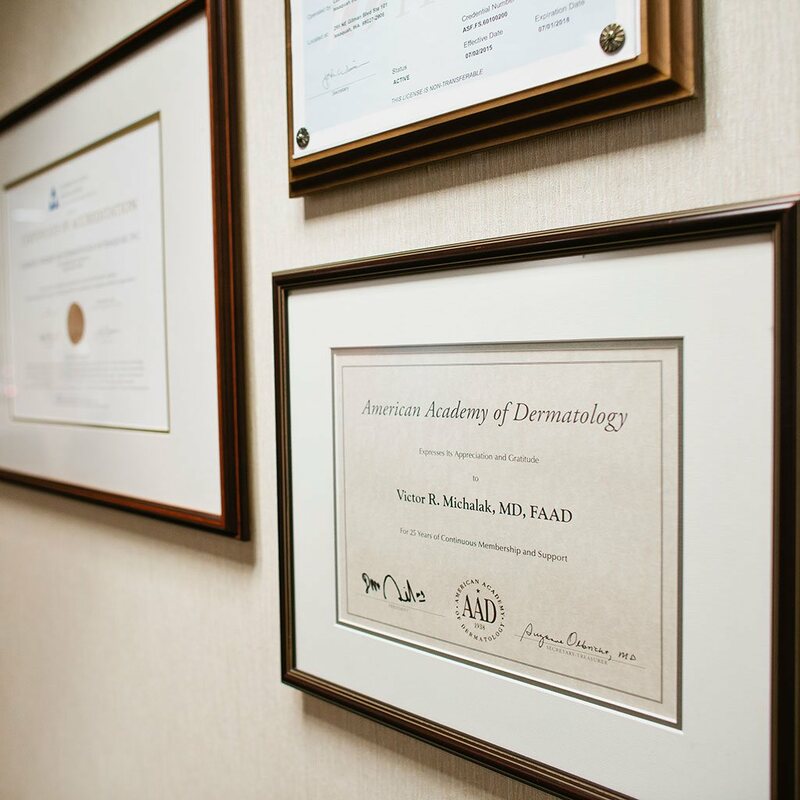 Dr. Michalak, you’ve been a practicing Cosmetic and Dermatologic Surgeon for over 25 years. How did you choose your particular areas of specialization? I was attracted to the sciences from a young age, and have always been detail-oriented, analytical, and a perfectionist. By the age of 17, I knew I wanted to be a physician and during medical school (at Cornell University Medical College), I realized I wanted to be a surgeon. I also decided that I wanted to practice medicine in a field that would allow me to make visual diagnoses. There’s a high level of skill involved in my chosen work, and it’s enabled me to combine my interests in visual analysis, pathology, and surgery. The field of cosmetic dermatology was also an exciting one to enter at that time, as important advances and innovations were underway. I knew the future of the specialty would be challenging and interesting, and it’s definitely turned out to be true. A good number of innovations in cosmetic procedures and treatments have come from cosmetic dermatologists. And after medical school, I was fortunate to be selected to do a residency at the Mayo Clinic, where I had fantastic exposure to a wide range of cases and was able to further develop my surgical skills. What brought you to the Seattle area? I first came to the Seattle area before starting graduate school and knew it was the place for me. After four years at the Mayo Clinic, I revisited the area and decided to relocate and open my own private medical and surgical dermatology practice, even though I was just starting out. It’s such a beautiful place to live and I like the diversity. Did it take a long time to develop your practice? What’s it like now? The practice went well from the start and, after five or six years, we outgrew the space and expanded. After 12 years in practice, we were still growing and that’s when we found our current location and built the facility I now have. It’s an excellent area in which to practice medicine: we have a widely varying population of patients, the majority of whom are highly educated and successful professionals. My practice offers comprehensive care – from general dermatology to skin cancer detection and treatment; cosmetic skin rejuvenation to laser and technology-based procedures, to liposuction – and cosmetic dermatology and surgery have always been the core components of the work that I do. The practice continues to grow, and we see patients of all ages. For the patient, are their advantages to choosing a cosmetic surgeon who is also a dermatological surgeon? The advantage is that I am trained to treat the whole patient – the underlying skin condition, as well as the outward appearance. As a cosmetic surgeon, I am evaluating my patient in order to determine which options for enhancement will yield the optimal outcomes and enable them to attain their appearance goals. Since I am a dermatologic surgeon, as well, I am also assessing and evaluating my patient for skin health, because health and safety are my top priorities. This means I’m trained to notice – and identify – any skin irregularities that might potentially be a skin cancer, for instance. If a biopsy is indicated and it turns out that my patient needs to have a skin cancer removed, that will be done first. Then the cosmetic procedure will be done. Doctors from a number of specialties are qualified to perform a facelift or a laser procedure, but cosmetic surgeons who are also dermatologic surgeons identify and treat underlying skin conditions and perform cosmetic surgery. There are also times when a surgical procedure has been recommended but isn’t yet necessary. For instance, a patient with skin laxity (looseness) might assume she needs a facelift when she can actually get the results she wants from a laser procedure that will tighten the skin and encourage the growth of new collagen. There’s no reason to do a facelift if the skin can be treated in a non-surgical manner. The health and best interests of the patient must always come first. Dr. Michalak, what is your definition of beauty and how does that impact the options you offer to your cosmetic patients in consultation? When I see a patient for the first time, there are two ways I’m evaluating and measuring what can be done to achieve the optimal cosmetic result: an objective measure and a subjective measure. For example, a new patient tells me that she wants a facelift in order to look younger and more attractive. Because I am both a cosmetic surgeon and a dermatologic surgeon, I’m first going to look at objective measures as a framework for a restorative approach. However, the more important measurement is subjective: how my patient views her own face, what bothers or concerns her about her appearance, and what changes she wants to see to feel that she looks her best. The implications here are significant. First, it means I am going to listen as carefully as possible to what my patient is telling me; then I’m going to ask questions relevant to what I’m hearing. Finally, it means I am going to try my best not to allow my own subjective viewpoint to influence my patient’s choices. I will give my objective opinion, of course, but my patient’s viewpoint is what I most want to understand and be responsive to. She (or he) may want more – or less – done than I feel is needed, but as long as her expectations are reasonable, I’ll go with that even if my opinion about what would look best is different from hers. However, if what she’s asking for is not appropriate – too extreme or unrealistic – I’m not going to offer it and caution the patient regarding such a choice. I’m going to rely on what I know is safe and what I believe to be in my patient’s best interests. What if a new patient isn’t certain about what kind of cosmetic procedure they need or want or whether the time is even right to consider it? That’s what consultation visits are all about – and why I always do them myself. I want to see and hear for myself what’s important to the person sitting across from me. I ask questions, I listen, we explore options, and we keep in mind that an elective procedure is just that: elective. That means my patient has the right to weigh options, carefully consider, and not feel pressured to move forward until the time is right. The right time, the right procedures, and the best care – that’s what I want my patients to have.